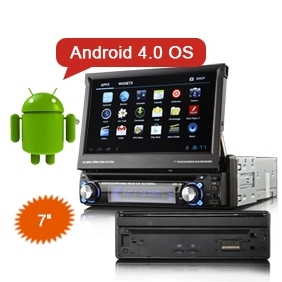 I recently bought a single DIN Android car stereo from Hong Kong and I'm trying to find out more information about it. It plays DVDs and CDs, has a USB host and can play movies from attached USB, iPods and micro SD cards. This is all handled by the WinCE 6.0 side of things (which surprisingly works rather well). It also supports GPS, which is handled by Android 4. I think to accomplish this feat, there are effectively two machines in there with WinCE displaying Android as another PiP video source. Unfortunately, my Android module stopped working within about an hour of fitting the unit. I had one happy drive with the GPS on and when I came back to the car for the drive home, Android/GPS would not come back again. I hadn't rooted, I'd done nothing but use the factory installed iGO software and changed/installed nothing on Android. It now just shows the Android logo/animation and sits there endlessly. 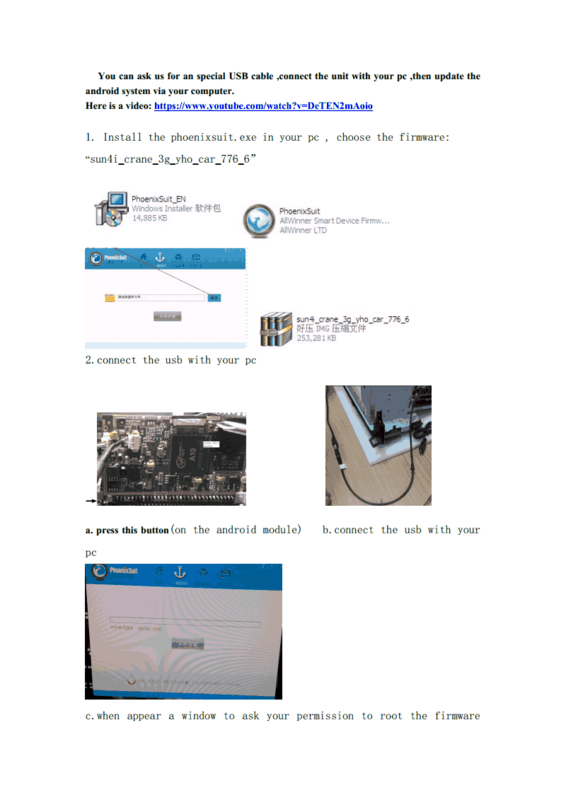 Since I'd bought the unit from a Hong Kong seller, I wrote to them asking if there was a factory reset or a method of hard resetting the Android module. "Michael" replied to me the following day with a link to a YouTube video that showed how to get Android to reformat the data partition for a factory reset. Unfortunately, this is for a different model and had no effect on mine. This is a shame as this ultimately looked like it might stand a good chance of working. I filmed myself doing what they'd asked and sent it back to Michael, asking if perhaps the reset procedure was different for this unit and if he had any other information I could use. He said he'd spoken to his boss, who had suggested cleaning the contacts on the detachable front panel with a toothbrush and if that didn't work, returning it for replacement. Yes, clean the thing that's working fine with a toothbrush. I replied (without being too insulting), saying there's nothing wrong with the front panel - or with the hardware for that matter. Android is bootlooping and I want to reset it by formatting the data partition. Surely there must be a procedure to reset the stereo to factory fresh? What if I wanted to sell it? I said I would try to find out more information before getting it replaced since I don't want to ship it back to Hong Kong to wait another couple of weeks and this could happen again. I also emailed Erisin to see if their technical help might be able to offer a solution (a little cheeky since I didn't buy it from them, but hey). They do seem to have more knowledge of the unit as people have asked a number of questions (including mine) on that page where they've been directed to customer support. I got a reply 24 hours later from "Sunny", stating I should turn the ignition off and do the reset, turning the ignition on again and holding it for 10 seconds. I was a bit disappointed since I included a list of everything I'd tried (and I'd certainly already tested that). I dutifully did it again anyway, nothing happened. There's a hidden factory menu accessible by pressing 1,3,5,7 on the DVD remote. This allows you to disable GPS and Android. Unfortunately, it just controls where the home menu link goes rather than turning off the Android hardware. Left the unit disconnected for 72 hours to force a hard reset. Michael got back in touch to send me a link to a google docs file that had a few more tips on resetting the Android module. It also confirms that the Android hardware is a separate board that is plugged into the main controller. The firmware filename hints at the Caravn 776 build, a modified version of which is available as GIBROID. 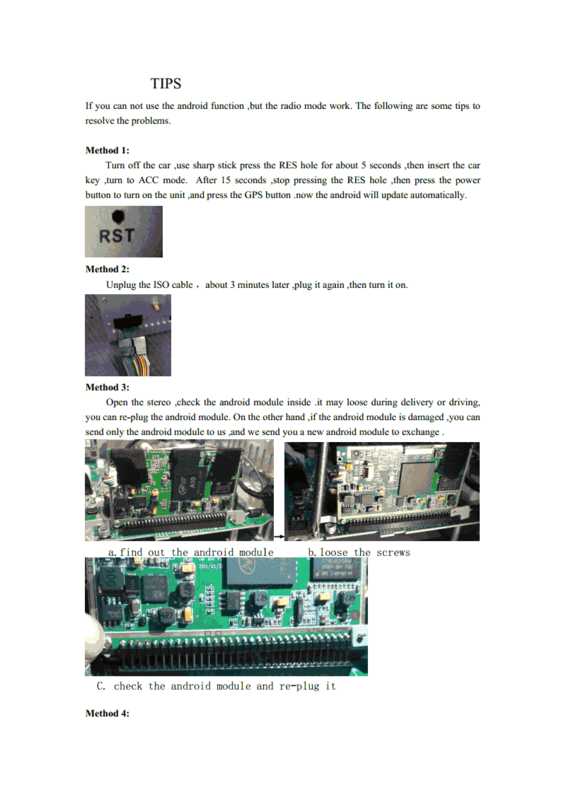 This also helps to identify the stereo as a CARAVN variant as outlined by XDA's Generic Android Head Unit page. GIBROID worked great! I have a customisable Android OS that boots from an SD card with root!